Cocktailiana » Blog Archive » So, It’s Your First Time? So, It’s Your First Time? This month’s Mixology Monday explores how to properly welcome someone to the world of cocktails. What drink do you suggest for the delicate palate of the cocktail neophyte? Something boozy and balanced, sure – but one wrong suggestion could relegate the newbie to a beer-drinker’s life. To which go-to cocktails do you turn to when faced with the challenge? It could be argued that choosing the Margarita as someone’s introduction to cocktails is dangerous as it doesn’t really push people out of their comfort zone; the Margarita just doesn’t seem that sophisticated to most people. However, if done with the right ingredients and presentation it can transcend people’s perception, satisfying even the most jaded Coors drinker. The great thing about this drink is how simple and disarming it is to most people. There are no real acquired-taste ingredients like Campari, Fernet or Absinthe, and it’s simplicity means it is something most anyone can create at home, making it a great gateway to an exciting future in mixology! Like all classic drinks, the Margarita has a shady history. As David Wondrich has written, “History, written in a bar, is never straight-forward”. There are almost as many origin stories as there are versions of the drink, though interestingly many of them involve lovelorn Mexican bartenders naming the drink after a beautiful showgirl… including Rita Hayworth who was formerly known as Margarita Cansino. Another common story is that the Margarita is really just a Daisy; a class of mixed drink that is basically a sour with a little bit of soda in it, and of course margarita is a Spanish word for daisy. Whatever the story, the one thing that is for sure about the Margarita is that nothing about the Margarita is for sure. As a type of drink, The Margarita is second only to The Martini in terms of how often it is bastardized. Nearly every bar has a version that could be said to be dramatically different from one another. Frozen or rocks, salt or no salt, Cointreau or triple sec, mango, strawberry – the list goes on. 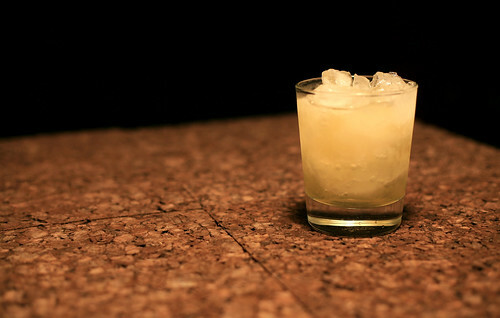 For us however, there is only one Margarita recipe; 100% agave tequila, lime juice and agave nectar. Shake all ingredients with ice and strain into an ice filled old fashioned glass. As you probably notice, our Margarita is missing two of its most common ingredients; Orange liqueur and Salt. For our money the agave nectar better highlights the spirits natural base than Cointreau, and the salt seems to us just a vestigial throwback to a need to cover up bad tequila. In fact in this San Francisco Chronicle article Tres Agave’s Eric Rubin speculates that the salt was introduced due to the Spanish influenza epidemic in the early 1900s and that Mexican doctors had the citizenry inoculate themselves with lime and salt. So the next time you have a cocktail n00b at your bar, take it easy on them and show them that cocktails don’t have to be frou-frou or toxic. The only real danger is that they may never enjoy the bad Margaritas at Chevy’s or Bennigan’s again. This entry was posted on Monday, March 9th, 2009 at 10:58 pm	and is filed under mxmo, Recipes. You can follow any responses to this entry through the RSS 2.0 feed. Both comments and pings are currently closed.